Perhaps no segment of farming is benefitting more from the ubiquitous power of mobile technology than precision agriculture. Just think about it — complete mobility to be able to monitor, store and share information at anytime, anywhere in the world via a smartphone or tablet has taken precision agriculture to another level. The evolution of mobile technology in precision agriculture should only continue upward over the next several years, too. Consider the next generation of farmers has grown up with this technology and feels completely comfortable using it. Their familiarity with iPhones and iPads should make it seamless for them to integrate mobile technology into their farming strategy. 1. iOS dominates mobile devices. As of October 2013, Apple has sold more than 170 million iPads since its release in April 2010, according to AppleInsider.com. So not surprisingly, iPads (63%) were the most commonly used mobile device among precision ag practitioners. It was followed closely by the iPhone (54%) and Android smartphone (36%). Other mobile devices being used in precision ag to a lesser degree are the Android tablet (10%), Windows tablet (8%) and Windows smartphone (6%). 3. Mobile slowly phasing out desktop computing. Are mobile devices making desktop computers obsolete? Perhaps they are in some industries, but not quite yet in precision agriculture. In fact, slightly more than half of respondents (52%) said they use their mobile device(s) “about the same as” or “more than” their laptop/desktop computer for precision ag work. Meanwhile, 48% use their smartphones and tablets less than their personal computers for precision ag-related jobs. 4. 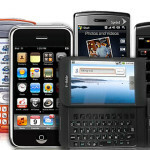 Mobile devices increase … mobility. Without question, the ability to work anywhere is one of the biggest advantages of mobile technology. When asked what locations they are using their mobile devices for precision ag-related work, most respondents said “in the field” (83%) and “in the cab” (62%). Interestingly, respondents are using them slightly more “at home” (51%) than they are “in the office” (49%). 5. Data collection No. 1 task performed. As the industry continues to emphasize the need to provide better data to growers to help them make better farming decisions, mobile technology will help immensely in this regard. So when asked how they use their mobile device(s) for precision ag purposes, it was not surprising that data collection was the most common answer to this open-ended question. Also mentioned several times by respondents was mapping, scouting and soil sampling/testing. 6. Mobile app is a key component. One of the main tools that enable a wide variety of precision ag work to be conducted on a mobile device is the app. And precision ag specialists are using lots of them. Connected Farm (Trimble) was the most used precision ag-related mobile app (31%), according to respondents. It was followed by John Deere’s JD Link (28%), Precision Planting’s FieldView (24%) and John Deere’s Mobile Farm Manager (16%). In addition, the overall attitude toward these apps is positive. More than 70% said they “agree” to “strongly agree” that most precision ag apps improve the quality of work they do. Shop Agrimart.net for all of your precision agriculture needs.